Snom MeetingPoint is the ideal complement for everyone who frequently needs to make multilocation arrangements. The Snom MeetingPoint allows you to have up to 4 parties at different locations all over the world attend your conference - without slow-mail delays and without costly travel expenses. Protect your travel budget and the environment at the same time! The snom MeetingPoint is perfectly qualified for use in medium to large conference rooms. 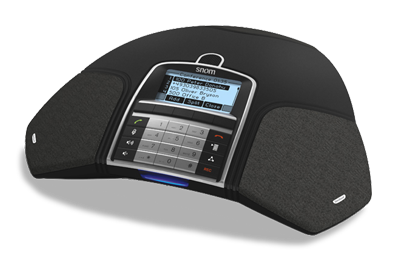 Thanks to its reliable suppression of disturbing background noise and its excellent sound quality you can hold your telephone conferences with large groups of up to 10 persons without adversely affecting the intelligibility of the call. Three speakers, equipped with full duplex wideband audio (7 kHz, codec “G.722”), provide balanced and full sound which snom customers already know from the snom klarVOICE handset. The integrated special microphones ensure that your interlocutors feel as if you are sitting in the neighboring office - and not on the other side of the world!